A pressure cooker is a wonderful tool for creating a tasty, home-cooked meal in a short amount of time. The Wolfgang Puck Pressure Cooker is a high-quality pressure cooker sold by the Home Shopping Network. It uses boiling water inside a tightly sealed chamber to create steam. The steam is trapped inside the cooker, creating a high-pressure environment that quickly breaks down the fibers of the food that you're cooking. With a small amount of prep work, you can easily create meals ranging from tortilla soup to beef burgundy and have them ready to plate in anywhere from 15 to 60 minutes. Review your recipe and make sure you have all the ingredients necessary. Start by putting the correct amount of liquid in the removable cooking pot.Then add the food, making sure that it does not pass the "2/3 Max PC" mark. 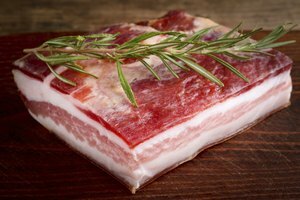 Unless stated otherwise by your recipe, meat should generally be added first and vegetables on top of the meat. Place the lid on the cooker and secure by grabbing the handle and turning counterclockwise.Turn the pressure release knob to "Seal." Now attach the power cord adapter to the cooker and then plug into your outlet. Press the "On/Off" button once to turn the cooker on. Press the "Function" button as many times as necessary to select the function you're looking for---rice, meat, vegetable, soup or stew. Each function has a preset time built in; however, you can add additional cooking time by pressing the "Time" button. Once you've selected your function, the "Heat" light will glow to let you know that the pressure cooker is building pressure. The cooking time will begin to count down once the correct pressure has been achieved. Depending on the instructions from your recipe, you will either need to turn the pressure cooker off by pressing the "On/Off" button and unplugging the cooker to allow the pressure to drop naturally or turn the pressure release knob to "Vent." When you can no longer hear steam releasing from the valve and the lid opens easily without force, the pressure is completely reduced. There is a safety mechanism that will prevent you from opening the lid if the pressure is not reduced. At this point, your meal should be complete. You can brown meat before cooking inside the pressure cooker by selecting any cooking function and preheating the pressure cooker without the lid. Add oil and brown the meat. 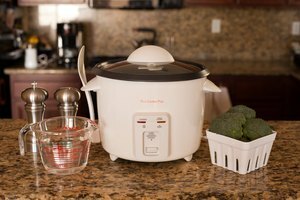 Unlike cooking in a slow cooker, pressure cooking concentrates the flavors of your food. Adjust the amount of seasoning you use to reflect this---when in doubt, use less, not more.